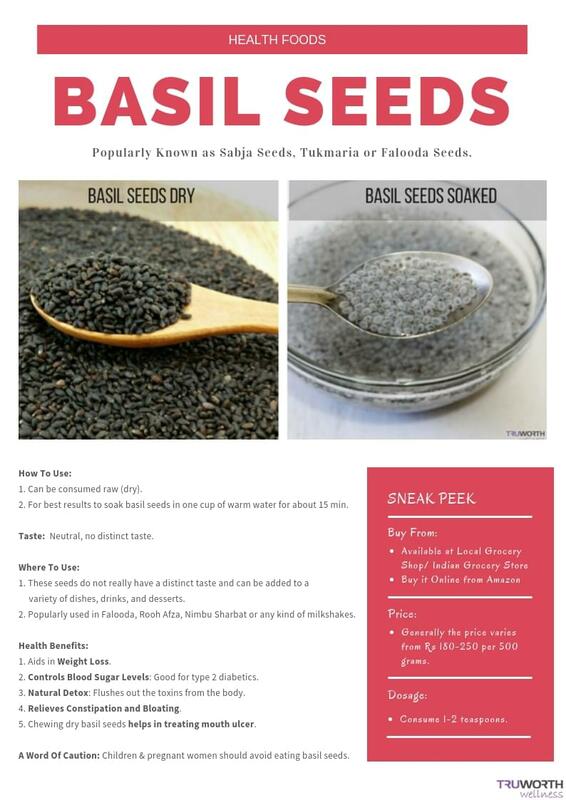 Basil seeds are also known as sweet basil, falooda seeds, sabja seeds, or turkmaria seeds are black and tear-shaped seeds. These seeds are rich in proteins, carbs, and essential fats and are packed with a good deal of fiber. They are rich in antioxidants and have antiviral, antibacterial and immunity-boosting properties. Basil seeds help in weight loss, reduces body heat, controls blood sugar levels, relieves constipation and bloating, treats acidity and heartburn, and is also good for your skin and hair. Adding these seeds to a variety of dishes will not only enhance the taste and flavor of food but will also enhance its nutritive value. They are great as a garnish for drinks and desserts. Blended in lemonade or sprinkled over kulfi, they impart their own fresh touch. You can also munch on these seeds as a low-calorie snacking alternative or add it to soups for a crunchy feel.